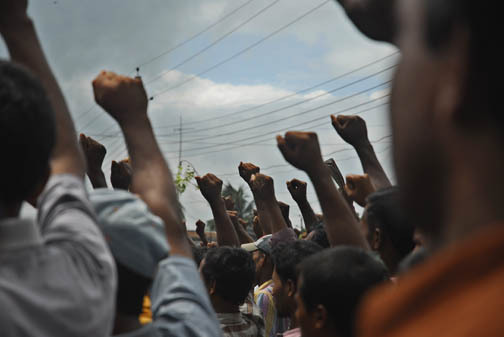 Panos Radio South Asia (PRSA), an undertaking of Panos South Asia, on October 15, 2007, podcasted a report on community resistance against Phulbari Coal Project in Bangladesh. In this latest edition Panoscope went to Phulbari, a small hamlet in north Bangladesh where, for the past several years, local residents have been resisting an open pit coal-mining project that threatens to displace thousands of people and destroy the environment. The controversy revolves around a clandestine deal between the erstwhile Bangladesh government and a British coal company called Asia Energy (now renamed Global Coal Management PLC). Asian Development Bank (ADB) is planning to provide US $ 100 million loan and US $ 200 million political risk insurance to Asia Energy. ADB is now conducting its due dilligence and scheduled to approve the funding the project in March 2008. Download and listen to the report. Visit Phulbari Resistance for more information on the community resistance against open pit coal mining in Phulbari. This entry was posted on Monday, October 29th, 2007 at 3:57 am and is filed under Asian Development Bank, Development Induced Displacement, Indigenous Peoples, International Financial Institutions (IFIs), Mining/Phulbari, News and Update. You can follow any responses to this entry through the RSS 2.0 feed. You can leave a response, or trackback from your own site. Though the East India Company, chartered by Queen Elizabeth I in 1600 AD with rights of monopoly trading in the eastern waters, launched their operation here more than 400 years ago and Asia Energy formally started their operation here just more than 10 years ago, there are many staggering similarities between the two companies. By the Queen’s Declaration of 1858, the East India Company was formally abolished but the British left our country only 61 years ago. The phantom of the East India Company in the name of Asia energy has come back here again from the same source and for the same purpose. First: Both the companies are of British origin and they both found Bangla(desh) suitable enough to be exploited. Second: The two companies used two non-European geographical names i.e. the East and Asia respectively, in order to get favour from the government and the people. Third: In the primary stage both the companies tried to be very friendly with the local administration here and consequentially they both were proved hypocrite and hostile. Fourth: The East India Company and Asia Energy caused bloodshed of the natives so as to establish their position here (the East India Company caused bloodshed in Palashi in June 1757 in association with local high official betrayers and the Asia Energy caused bloodshed in Phulbari in August 2006 with the help of BDR in association with local high officials). Fifth: Both Asia Energy and the East India Company came here in the name of doing business but later they both created chaos and disorder which led to massive movement. Sixth: Both the companies were accused of exploitation, plundering, looting and malpractice. Seventh: Both the companies managed to have some local cohorts in their favour. Eighth: The main objectives of the two companies were/are only to make money and send them back to Britain. 1. In the motivative advertisement Asia Energy has mentioned that they like to use “efficient and safe mining methods”. We specifically want to know what this “efficient and safe mining methods” actually means. Of course, they mean disastrous open-cut method. More clarification is needed. 2. Asia Energy has mentioned that about 15 million tones of coal can be extracted annually for a long period of about 35 years. But our experience says that foreign companies usually show the amount of mine resources many times more than the actual reserve so as to convince the government to extract the resources in a larger volume to finish the project fast. By doing so they can earn brisk money within a very short period of time without working for a long time. For example, they can make the same profit within 15 years instead of 30 years if they just make the extraction rate double. What, if their estimation proves wrong in the same way in the future? Some US oil companies played the same game in our country. 3. It is mentioned that “Phulbari coal will have a positive impact on Foreign Exchange Reserve.” How is it possible? As a matter of fact, Asia Energy will take back their huge profits to Britain either in US dollar or British pounds or in Euro and it may create crisis in the Foreign Exchange Reserve instead. Are they talking of coal export to bring dollars/pounds home? If it is so, should the people of an energy hungry nation allow this? They should explain the fact more explicitly how it will have a positive impact on the Foreign Exchange Reserve. 4. Asia Energy in the advertisement talks of the safety the environment. As to this point, they say that they will pump back their “treated water” in the rivers. How much safe is the treated water? Won’t it pollute the rivers? BHP, a multinational coal company, “created disaster in Ok-Tedi Copper Mine in Papua New Guinea where it had to quickly abandon the mine and paid hefty compensation to the surrounding inhabitants. The poisonous mine water seepages contaminated the nearby river and destroyed everything downstream.” Considering environmental disaster, BHP that discovered the Phulbari coal mine in 1997 left Bangladesh. 5. Asia Energy asserts “Land used by the Project will be rehabilitated to its proper state for agricultural and other productive uses.” But it didn’t mention when, how and who would be owner of the rehabilitated land. What does the term “proper state” mean? Why don’t they use the term “to its previous state”? And what will be terms and conditions of getting back the land? 6. “During project implementation approximately 40,000 people ….. will be resettled in phases.” How long would it take to resettle the 40,000 people? 7. “Financial assistance will also be available for a period of time to support the affected people.” How long will be the “period” mentioned? How much financial assistance will the people get and under what terms and conditions i.e. what will be the nature of this financial assistance? 8. Asia Energy in the advertisement invited queries through a Bangla website: http://www.phulbaricoal.com but this advertisement is in English. The common people won’t understand the advertisement because it is in English and they cannot make queries as they don’t have access to internet or websites. Then who do they mean it for? How will the general people know about the proposals and make queries? Is it to keep the common people in darkness using complex tactics of publicity which is beyond the reach of common people due to linguistic or technological barrier? 9. Finally, Asia Energy in the advertisement has so far talked about the benefits of Bangladesh and her people surrounding Phulbari coal mine but there is not a single word about the benefits of Asia Energy. That is to say, how much money will they make from this project and how? What will be their other benefits? If they have the right to disclosing our benefits, of course, we should have the right to know about their benefits as well. What Asia Energy is going to do must not be allowed in Britain, the company’s native land, considering the long-term disastrous effects. Asia Energy will someday leave Bangladesh with the huge money. Probably the local decision makers may not have to go to Phulbari to reside in; hence they won’t have to suffer the post-coal extraction effects. But what will be the fate of the people living there? Should we let another East India Company create a gruesome human catastrophe? Should forget so fast the irresponsible activities and heinous misdeeds of the East India Company? Should we forget the consequence that we had to suffer for 190 years? We need to think twice before taking the generous offers made by any multinational companies who are nothing but sheer money monger. Should Water Be Legislated as a Human Right?